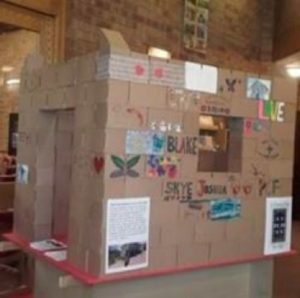 Poynton Methodist Church are committed to raising £7,500 before March 2019 – this represents the cost of building a house for people in Haiti who are still reeling from the effects of the earthquake in 2010 and Hurricane Matthew in 2016. This is the story that inspired us to set ourselves this challenge. Vilia lost her mum and her home when the earthquake struck Port-au-Prince in 2010. Bereaved and homeless, she went back to her home town with her husband and children. But life was a struggle, and they had nowhere safe to live. Christian Aid partner KORAL built her a new home that was strong enough to stand up to natural disasters. We know how to make it happen – of the 700 houses we built after the 2010 earthquake, just one needed to be repaired after Hurricane Matthew. Our fundraising is going to focus on building this house in the Methodist Church at Poynton. Every time we raise another £38 pounds we are going to add another brick. If you would like to buy a brick as an individual or a group then just donate £38 pounds (using the form available in church) and we will give you one. 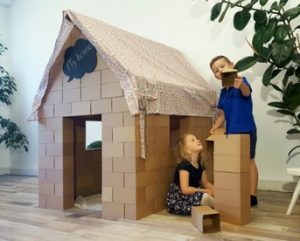 You can decorate it however you want (they are all made of brown cardboard) and bring it back and add it to our house. When reach our target we will have a service of celebration and then donate all the blocks to our toddler group to enjoy. The four designs of alternative gift cards were very popular at the Charity market, so thanks to the designers of these – Judy’s daughterBeth, daughter-in-law Georgie, Phil Maltby and the internet! Our house also now has a name, chosen by Jude, the area manager of Christian Aid, which is “Haitian Hope”. You will also find the sign-up sheet for the monthly Church family lunches on the foyer notice board. On 2nd December there will be a soup/sweet lunch and at the 6th January lunch you will be treated to hotpot. To help catering, please sign up early. We are now up to roof level with the bricks. Can we roof our house in time for Christmas? Come along on Christmas Day and find out! The next events are a series of fundraising lunches after church (about 12:00) on the first Sunday of each month. Come along and share food and fellowship and donate what you would otherwise have spent on lunch to a good cause. 3rd February Celebration roast! Ever hopeful!